Sunshine and brisk ocean breezes this late-afternoon Wednesday on California’s north coast — warm temperatures, though, if you find yourself with a wind-break. ‘Warm‘ being relative, of course. Nearly a third of the world’s population is now exposed to climatic conditions that produce deadly heatwaves, as the accumulation of greenhouse gases in the atmosphere makes it “almost inevitable” that vast areas of the planet will face rising fatalities from high temperatures, new research has found. Climate change has escalated the heatwave risk across the globe, the study states, with nearly half of the world’s population set to suffer periods of deadly heat by the end of the century even if greenhouse gases are radically cut. “For heatwaves, our options are now between bad or terrible,” said Camilo Mora, an academic at the University of Hawaii and lead author of the study. Mora’s research shows that the overall risk of heat-related illness or death has climbed steadily since 1980, with around 30-percent of the world’s population now living in climatic conditions that deliver deadly temperatures at least 20 days a year. The proportion of people at risk worldwide will grow to 48-percent by 2100 even if emissions are drastically reduced, while around three-quarters of the global population will be under threat by then if greenhouse gases are not curbed at all. “Finding so many cases of heat-related deaths was mind blowing, especially as they often don’t get much attention because they last for just a few days and then people moved on,” Mora said. 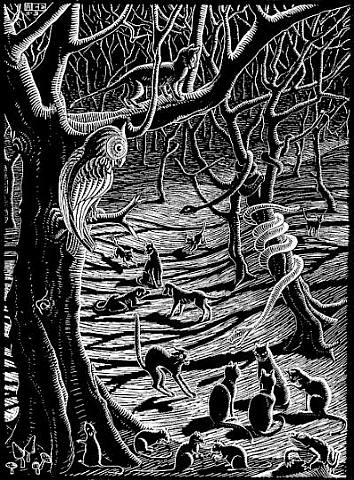 (Illustration above: M.C Escher’s ‘Scholastica,’ found here — used an Escher the last couple of posts, signifying maybe some weird).